What a combo, right? I've been called many things, but never (cough, cough) boring. Giveaway(s): I'm offering a nice little giveaway if enough of you are interested. 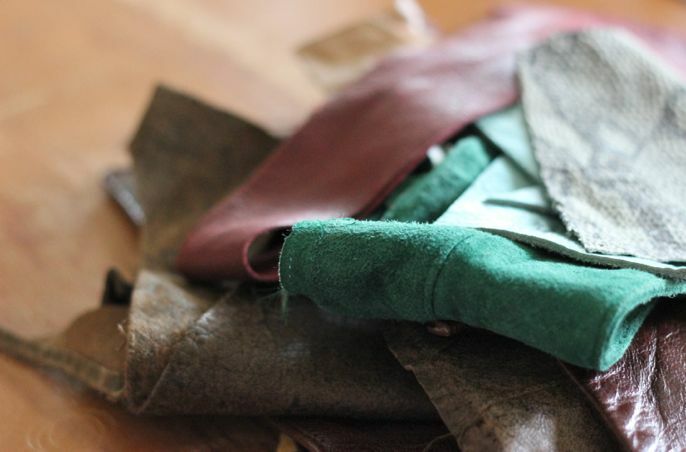 I have accumulated a massive amount of leather scraps - more than I could ever use and I hate to throw anything away. Think pendants, cuffs, flowers, etc. If a few folks are interested, I'll send you a package. If more than a few are interested I will put together several packages to win. Remember, they're scraps - no bigger than 4-5" but useful for the right project. Each package will be just under 13oz (Continental US only). Actually, cooking gluten free is extremely easy now that it's becoming more common. This is a super simple, go-to wintery comfort potato soup. In fact, I'll bet you've already got the ingredients in your pantry. Bring the potatoes to a boil in a large pot of water. Once it's boiling, allow to simmer until the potatoes are soft - generally about 15 minutes. While that's cooking, add olive oil to a large saute pan and saute the vegetables (with salt & pepper to taste) until translucent. If you decide to add garlic, add it near the end so that it won't burn. Drain the potatoes, add the sautéed vegetables, then the broth or stock. Check to see if you need to add a little more salt or pepper. Bring to a boil and then simmer. If you have an immersion blender, blend until about half of the potatoes are creamy. This will thicken the soup. If you don't have an immersion blender, take half of the mixture and blend in a blender until smooth then add back to the soup. Garnish with a little sour cream (or crumbled bacon or cheese or all three) and enjoy. oh yummy! and sour cream always seems to make everything complete :) Definitely going to have to try this recipe. but yes, yes, count me in. I'm gonna sign up for Barbara's online class as soon as i have some do-ray-me. Leather and torching......swoon! oh wow that soup looks soo yummy! will have to try it!!! i too would love to win some leather pieces! a girl can never have too many options! Soup sounds yummy. 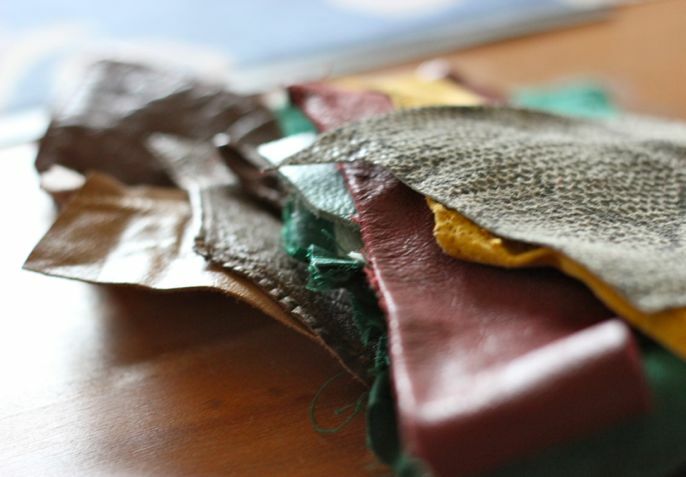 But the leather scraps sound even yummier! Besides bead embroidery, I can think of a number of other ideas - thanks! Who in their right mind would not love some of your lucious leather pieces!? Now that said, I'm going back to check out the soup recipe ...thanks! I would love to win some scraps as well! My friend Lindsey and I have decided to make our version of a crazy quilt and I think adding leather to it would give it an interesting and unexpected texture!!! I think add it to a block and hand embroider something on the leather???? Strangest thing...on Tuesday I was thinking about heading over to Fabric Mart (we call it "the cheap store") to see if they had any pieces of leather. I have a project in my mind and need small pieces of leather. I woke up this morning, read your blog post and thought "Kismet!" I would love to be included in your drawing! That soup would have been wonderful last night as it was cold and rainy/stormy. I will try it soon. I would love to be included in the drawing. I have been wanting to try some cuffs and some flowers to attach to necklaces. I also quilt and that would be interesting as either a patch in a quilt or an embelishment on a quilt. Thanks for the chance. I think I would be able to use some leather in making jewelry! 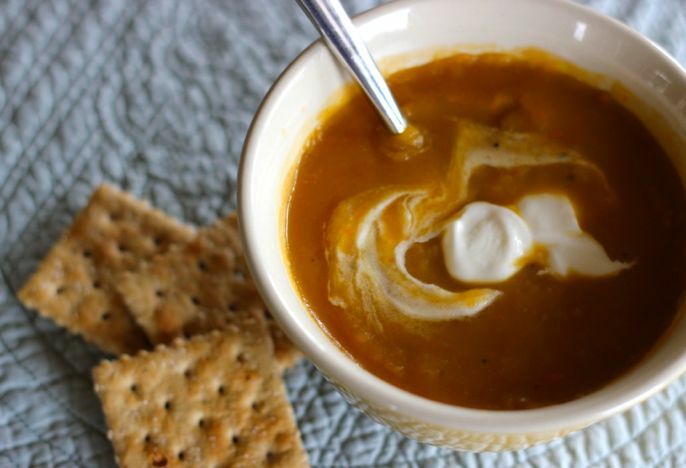 Your potato soup recipe sounds delicious and easy. I really want to get an immersion blender. Maybe this will be the push to pick one up! Lori, I would love to get my greedy little hands on some leather scraps. I have been wanting to venture into mixed media and those would be the push I need. :) Flowers, fringe, small connectors .. hmm .. I have an old purse laying around. Maybe I should get started now. Well, with this many comments, I'm sure this has turned into a contest by now. Please throw my name in the hat. I think I could use the leather (provided I can find a pair of scissor to cut it) in my jewelry making! Thanks! great recipe !! I am a seamstress and i love to use every thing! Would love some scraps !!! That soup looks amazing! With all the snow we got today I am just craving soup, my blanket and a comfy place to curl up and read. I would love to be included in the scrap giveaway. I've been thinking about adding some leather to my jewelry, and wondering where I should look for it. That soup looks delicious! Does it smell as good as it looks? Yeaaaaah, immediately I knew I couldn't possibly be the only one interested in your stash of leather scraps. I was right, DANG! Thats some good lookin' soup. I would love an opportunity at some leather scraps. I have been looking for pieces to incorporate into jewelry designs. I love using materials that have a story (in this case, re purposed). Thanks for the soup recipe. Looks super tasty and simple enough for me to make. I hate cooking but love to eat! Nice recipe! Count me in on the scraps! I do not work with leather and it would be fun to give it a go. Annie could get creative with it, especially. Thanks! That soup sounds delish. I do love a good potato soup! As far as the scraps, I'm sure I could find some way to work with them in my jewelry. I do love all kinds of bits of odds and ends to include in my work. Thanks for offering them up! aww man I hate I missed the giveaway but this recipe sounds delicious. Must try! I love your blog and the beautiful colors and the tote bags and... I would love to have some scraps to use in my jewelry making and sewing. I think I may be the scrap (my husband says 'crap')queen of the south!We live in a small town right smack dab on the banks of the mighty Mississippi River and what a beautiful view! (which I love to photograph- but I digress) I also enjoy decopauge on canvas, sewing various small projects, making cards & scrapbooks for our 2 grown kids and others. Oh, and I love your blog! I wish I had your sketching ability! Tres Belle!